November 9 – December 1, 2019, the 27th Annual Trappings of the American West Exhibition & Sale will be presented by the Dry Creek Arts Fellowship in a new and exciting collaboration with the Desert Caballeros Western Museum. Trappings of the American West is a unique exhibition that combines fine and functional art of the American cowboy. This year, the exhibition will feature new work by eighty of the country’s top artists from fourteen Western states including members of the Cowboy Artists of America, Traditional Cowboy Arts Association, and the National Cowgirl Museum and Hall of Fame. Trappings showcases the talents of master painters, sculptors and photographers, along with contemporary cowboy gear created by gifted craftsmen and women. Saddles, boots, hats, knives, engraved bits and spurs, hitched horsehair, braided rawhide, and musical instruments will be featured in the exhibition. All artwork is available for purchase. In addition to the exhibition, the Dry Creek Arts Fellowship will present a great series of public programs that will occur each weekend. These will include a performance by “The American Songster” Dom Flemons, interpretive lectures, artist demonstrations, cowboy poetry, and more. 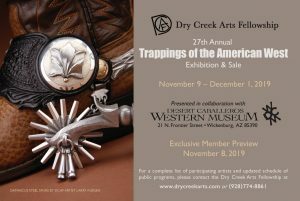 For more information on the 27th Annual Trappings of the American West, a complete list of participating artists, and updated schedule of public programs, please contact the Dry Creek Arts Fellowship at www.drycreekarts.com or (928) 774-8861.